Children enjoy the festivities of the EcoMobility World Festival in Suwon, South Korea. Photo by Carlos Felipe Pardo. As the EcoMobility World Festival enters its final week in Suwon, South Korea, questions arise about the future of the city’s Haenggung-dong neighborhood. With over 4,300 residents, Haenggung-dong is one of Suwon’s most crowded neighborhoods, and has been a car-free zone for the whole month of September. Halfway into the month-long festival Haenggung-dong was 95% car-free, an impressive feat considering how difficult it can be to convince people to use alternatives to cars. The question is, will pedestrians and eco-friendly vehicles continue to dominate once the experiment draws to a close? Although the festival initially encountered generous skepticism and opposition, many Haenggung-dong residents have now grown to prefer an ecomobile lifestyle. Replacing cars with broad pedestrian walkways, bicycle lanes, and other creative, sustainable vehicles has created a vibrant and people-oriented environment. Visitors have also enjoyed exploring all that a car-free neighborhood has to offer – the latest statistics revealed that over 310,000 people have already visited Haenggung-dong this month. The warming of residents and visitors alike to an innovative, ecomobile environment is an important shift in perceptions and behavior that other cities can take a cue from. A major reason cited by Haenggung-dong residents for their original criticism of the festival was a perceived risk to their livelihoods. Shopkeepers were particularly outspoken in their opposition to the experiment. Lee Young-Son, the owner of a favorite local cafeteria primarily patronized by taxi drivers, feared that she would lose her source of income during the month of September. A popular hairdresser had similar concerns about her regular customers taking their business elsewhere, and initially flew a banner opposing the festival in front of her shop. The stories of these Haenggung-dong business owners are reminiscent of shopkeepers in Arequipa, Peru, whose perceptions also changed to favor the transformation of “calle Mercaderes” (Mercaderes street) to a pedestrian corridor or businesses in Istanbul’s Historic Peninsula. In addition to the business boom Haenggung-dong has experienced as a result of the EcoMobility World Festival, the air quality and noise levels of the neighborhood have also significantly improved. These indicators, which enhance the vibrancy of the neighborhood, are characteristic of the revitalization that creating car-free zones can spark. 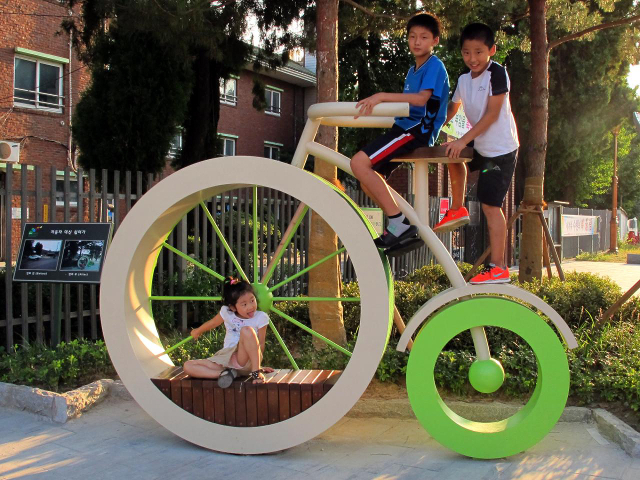 Doo Chang Wuk and Doo, Myeong Hee are two Haenggung-dong residents who can attest to the benefits of their newly car-free neighborhood. Although they used to be frequent car users, since the beginning of the festival they have discovered the perks of alternative transport methods like walking and bicycling. Doo, a retired employee of South Korea’s Ministry for Education, stressed in a recent interview the importance of raising awareness among children and adults alike regarding the positive health, environmental, and social benefits of living an ecomobile lifestyle. He also suggested that Suwon’s car-free zone be expanded across additional neighborhoods. With the popular support of many Suwon residents behind the EcoMobility World Festival, what happens when it concludes on September 30th? The lasting impact of this month-long experiment will be determined by the urban dwellers themselves, said Mayor Yeom. “Whether or not this new ecomobile lifestyle will be continued will be entirely up to the residents,” he stated. He also shared optimism that the project would not only inspire residents in Haenggung-dong to continue using eco-friendly transport options, but also catalyze actions elsewhere. As part of this mission to stand alongside international partners and efforts to raise awareness about sustainable transport options, Mayor Yeom signed the European Mobility Week charter last May. European Mobility Week, which took place from September 16 to September 22 this year, is a major annual campaign for sustainable urban mobility with over 2,000 participating cities in 43 countries. Although European Mobility Week occurs on a broader, more regional scale than the EcoMobility World Festival currently does, Suwon has taken a bold step forward in implementing sustainable transport options. Haenggung-dong’s month long car-free experiment, and the aftermath that is soon to come, is a pioneering example for cities in Asia, Europe and beyond.